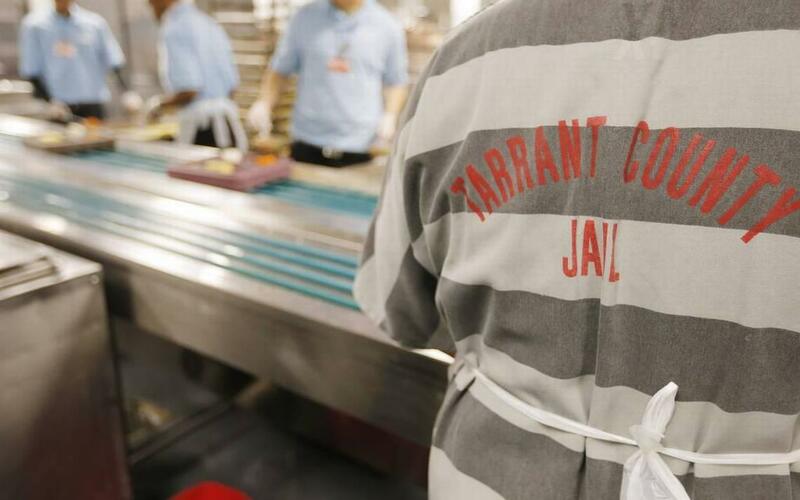 Kitchen workers in Tarrant County's Lon Evans Corrections Center. There’s not much Republicans and Democrats seem to agree on in Austin these days, but criminal justice reform is one area that has found bipartisan support over the past decade. This year, lawmakers have introduced scores of proposals intended to improve the way police, courts, jails and prisons do business in order to make the system fairer and reduce the cost to taxpayers. Committees in the House and Senate are beginning to work their way through the proposals. The death of Sandra Bland is overshadowing many of the reform proposals. Bland’s suicide in 2015 in the Waller County jail caused protests and sparked questions about policing and jail policies. Bland was arrested after she was pulled over by a state trooper in Prairie View for failure to signal a lane change. After an argument, the trooper ordered her out of her car and arrested her. She was found hanged by a plastic bag two days later. The trooper who arrested her was suspended for failing to follow protocol and later dismissed by DPS after he was indicted for perjury. Bland’s family filed a wrongful death lawsuit, and settled for $1.9 million. Last week, state Rep. Garnet Coleman said Bland’s experience provides a roadmap of problems in the justice system. “We’re here to provide solutions to the challenges in criminal justice that many say should be reformed. And because of that I filed House Bill 2702, the Sandra Bland Act,” he said. The Houston Democrat’s proposal is sweeping. The 55-page bill would revamp the state’s racial profiling laws, overhaul arrest and jail procedures and ramp up training and oversight of law enforcement and corrections officers. Its reception by law enforcement has been mixed. One police association called it misguided. Coleman expected pushback. “It has not been a very popular thing to do,” he said. The future of the Sandra Bland Act is uncertain, but one issue it is attempting to tackle is the focus of other legislation: Keeping people out of jail before their court date when they pose no risk to the community. Matt Simpson from the Texas ACLU says Bland’s story is instructive. After all, she was in jail because she couldn’t afford the roughly $500 she would need to pay a bail bondsman to get her out. “The Sandra Bland case was a real reminder that having someone go to jail and sit out their time may not be the best way to handle pre-trial detention. If someone is going to appear in court, we may not need to stick them in jail for an extended period of time, especially if they’re low risk,” he said. Sen. John Whitmire, the powerful Houston Democrat who heads the Senate’s criminal justice committee, is expected to introduce a major bail and pre-trial services reform bill soon, which will likely include recommendations from the Texas Judicial Council, the policy and research arm of the state’s courts. The council found that county jails in Texas spend more than $905 million each year to lock up people before their trials. The bail industry is expected to oppose the legislation, but Derek Cohen from the conservative Right on Crime campaign says there’s bipartisan support for reforms. “If we look at just the amount of people awaiting trial without any risk justification, we’re talking about tens of millions of dollars across the state that’s going down the drain for that,” Cohen said. Other criminal justice proposals run the gamut from preventing people from being jailed for the most minor of crimes and strengthening poor defendants’ access to lawyers, to marijuana decriminalization and a range of policing reforms. Better treatment and alternatives to jail for substance abusers and people with mental illness throughout the criminal justice process is a major theme. Nearly a dozen bills aim to rein in civil asset forfeiture. That’s when law enforcement agents seize property and cash from suspected, but not convicted, criminals. Cohen says taking citizen’s property without actually proving that it was used in a crime is wrong. “The criminal element is alleged, but not actually substantiated to the same degree that an actual criminal complaint must be substantiated,” he said. Another big, bipartisan push looks at 17 year-olds in the justice system. Right now, Texas is one of a handful of states that automatically treat them as adults. Advocates on the right and left say those 17 year-olds should be treated as juveniles, and should be sent to juvenile detention facilities that have more rehabilitative services for them. The ACLU’s Matt Simpson says there’s broad agreement that it’ll reduce recidivism and benefit those kids but it may not pass. “I think the debate is it going to be expensive and 'do we have the capacity,' not 'is it the right thing to do,'” he said. Simpson says experts predict long-term savings from the switch, but it comes with hefty price tag up front. In a year where Texas has less money coming into its coffers, costly measures may not become law. Simpson says that describes a lot of criminal justice reform proposals this session. Correction: This story originally reported Sandra Bland was in the Waller County jail because she was unable to pay a $500 bail. Her bail was actually $5,000. What she couldn’t pay was the roughly $500 fee required for a bail bondsman to bond her out.